Oracle 12c realizes that multi-tier applications are the current industry standard and compose multiple web, application, and database servers providing content to thin clients with presentation via a web browser. Ever wonder what’s behind the scenes when you log in to a web application for online purchases or banking? Communication from the browser to the web server occurs via HTTP (HyperText Transfer Protocol) or HTTPS for secure (encrypted) data. Web servers conceptually act as web listeners; they receive requests from browsers and return formatted result sets with little processing on their own. Once on the web server, the browser request is parsed and sent to the appropriate application server for processing. The application server component may be on the same physical server as the web server, or it may be on another physical server. By far, the most common web server is Apache, or one of its commercial derivatives, with over 50 percent of the market share according to Netcraft. At the application server level, the user request is processed using the relevant application logic. One very common method is to use a Java application server, such as Tomcat, Orion, or Glassfish. In this case, the program logic is executed inside a Java Virtual Machine (JVM), which acts as the runtime environment for the program code. Another popular tool is Oracle Fusion Middleware (OFM). Within OFM, the program may run as Oracle Forms, Reports, Discoverer, or even Java via Oracle Containers for J2EE (OC4J). Regardless of the product, it’s within the application server component that the application logic is executed. During processing on the application server, it’s common to need database access to query, create, update, or delete data. 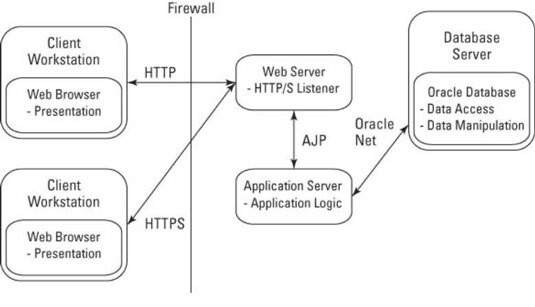 The application server communicates with the database server via protocols, such as JDBC or Oracle Net, to access the data. During this time, the application server is accessing the database on behalf of the user making the application request. Rather than connecting as a named, distinct user such as JSMITH, the application server connects using a generic web account (such as WEB_USER). Multiple simultaneous connections from the application server to the database form a connection pool that allows any database connection to access data for a request. Connection pooling is a performance benefit because only a few database connections can service thousands of requests on behalf of many users. When logged into the database instance, the generic web user queries or executes DML on behalf of the application server, which is processing an actual user request. The connection pooled web user doesn’t have schema ownership into the database; it has only those permissions needed to access or update data on behalf of the application server. During this time, normal database roles, permissions, and grants are used. Additionally, database program logic implemented in PL/SQL via procedures, functions, and packages is often executed. After the data result set is generated on the database-tier, it’s passed back to the application server for more processing. Next, the results are relayed back through the web server and across the network for presentation to the user via their web browser. You can use components from different vendors in a “best of breed” configuration. For example, you can use a free Apache web server instance coupled with Tomcat or Glassfish for a cheap application server component. Then tie that to the power of the Oracle database, and you have a solid system at lower costs! As more users come online, you can add more web, application, or database server instances to boost your processing power. Rather than buying bigger servers, just buy smaller servers. After you have a series of multiple servers, you gain fault tolerance. This is called clustering. If a web server crashes or the application server needs maintenance, no problem — the redundant servers will pick up the workload. Hopefully, these benefits show why multi-tier system architectures are the industry standard and have surpassed client-server systems.